Typhoon Tembin has strengthened and is expected to make landfall today along the coast of Southern Vietnam after killing 200 people with as many missing and leaving 70,000 homeless. The storm which is now packing winds gusts of up to 115 km/h is travelling west at a speed of 22 km/h. 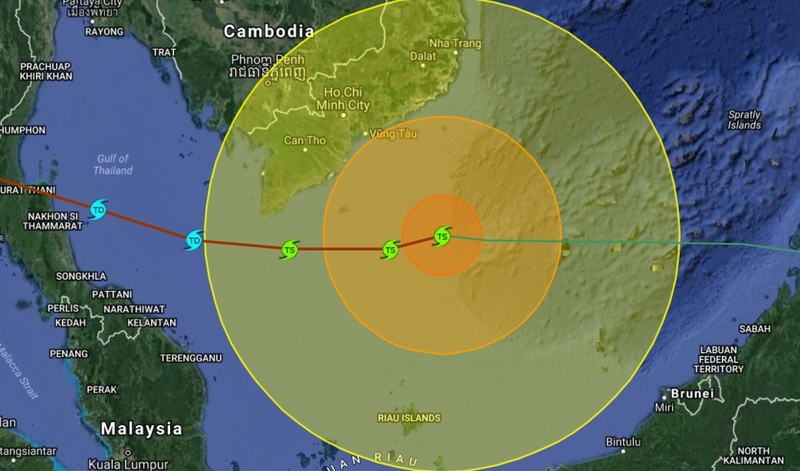 According to Viet Nam News, a total of more than 1.1 million people in 15 provinces and cities in the south were relocated to safe places before Typhoon Tembin could make landfall. According to the Central Hydrometeorological Forecast Centre, at 7 am today, the storm’s centre lay some 320km east of Côn Đảo, off the waters of Bà Rịa-Vũng Tàu. Wind speed reached up to 90-115km per hour. Dozens of flights to and from Hồ Chí Minh City, Phú Quốc and Cần Thơ have been cancelled due to Typhoon Tembin. Vietnam Airlines (VNA), Jetstar Pacific (JPA) and VASCO (OV) announced plans to reschedule Monday’s flights due to the storm.